Last month tied with June 1998 as the third warmest such month since 1880. Only June 2015 and 2016 were warmer, according to the monthly analysis released this week by NASA’s Goddard Institute for Space Studies. 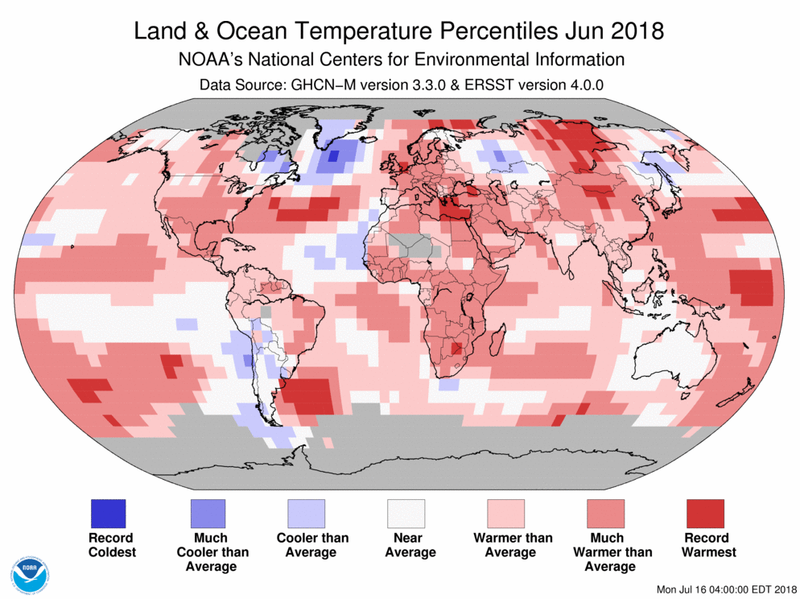 Today, the National Oceanic and Administration issued its own, independent analysis, with somewhat different results: June 2018 was the fifth warmest, according to NOAA. The rankings differ because the two agencies use different methods to analyze global temperatures. But over the long-term, their global temperature records have been in strong agreement. For example, the analyses from both agencies show that the ten warmest Junes on record have all occurred since 2005. The graph at right shows just how close NASA and NOAA’s analyses have tracked over time, and how they’ve aligned with a separate British analysis known as HadCRUT. NASA’s map at the top of this post shows the patterns of temperature anomalies around the world in June. A couple of things stand out. One is the particularly intense heat over Siberia. (NOAA’s anomaly map shows the same hot spot.) This has contributed to ferocious wildfires that have been burning there, including some that created a smoke plume so prominent that it was visible to a satellite a million miles from Earth — even after it had travelled thousands of miles to Canada. Another notable anomaly is the relatively cool temperatures over the Arctic. Usually, the Arctic shows more warming than other parts of the globe, a phenomenon known as “Arctic amplification.” But Earth’s complex and chaotic systems don’t always stick to the script, as was the case last June. The cool June temperatures in the Arctic contributed to another notable development: The retreat of sea ice occurred more slowly than the long-term average for the month — something that we rarely see these days. Now that we’re into July, sea ice retreat is tracking close to the long-term rate, according to an analysis just released by the National Snow and Ice Data Center. But even that is unusual. In recent years we’ve become accustomed to ice loss occurring at rates much faster than average.
. . . June 1998 was exceptionally warm at the time due to the then prevailing strong El Niño conditions — about 0.33°C above the trend line of the late 1990s. In contrast, the current El Niño phase is considered neutral. It may not stay in neutral for long. We are probably headed into a new El Niño this coming winter. If that happens, the El Niño would likely make 2019 especially warm. In the graph above, which shows how the world has warmed since pre-industrial times, note the super El Niños of 1998 and 2016. Those spikes stick up prominently from others in the plot. The 2016 spike is particularly prominent, and that year smashed all previous records for warmest year. But without El Niño, it probably would not have done so. In fact, when the effects of the 2016 El Niño, and a subsequent cooling La Niña, were statistically removed from the record in a recent NASA analysis, 2017 would have taken the crown for warmest year on record. But as the graph also shows, none of this changes what’s been happening over the long run. Despite the up and down wiggles caused by monthly and annual variations, the inexorable upward trend over the timescale of decades is very clear. The green line in the graph above shows what that trend line looks like between 1970 and 2017. The numbers work out to warming of about 0.17 degrees C per decade. Going forward, we shouldn’t be surprised to see extended periods during which the rise in global temperatures slows — as has happened before. But ultimately, we can’t get around the relatively simple physics that are driving the overall trend. By pouring carbon dioxide and other greenhouse gases into the atmosphere, we’re causing what scientists call a “radiative imbalance.” That’s a technical way of saying that less energy is exiting the top of the atmosphere than is entering in the form of sunlight. The result is global warming, and all its attendant climatic impacts. Even after all the fraud uncovered in the global warming argument, articles still pop up trying to convince us to believe this faux religion.